If you love amber based fragrances then you need to drop everything and sprint to your local anthropologie store. 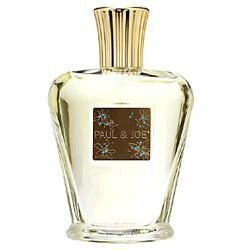 Paul and Joe's Bleu bottles have made a brief appearance. Griff from MUA alerted us to its presence last night. When I caught a whiff on cavewoman I was hooked. We both purchased the bottles. If I have any Cleveland readers I am sad to inform you that the Legacy store is cleaned out. Call before you make the trip. Back to the fragrance: It is staggering. I might even venture to say that it gives Hermes Ambre Narguile a "run for its money". The notes are Bergamot, Cilantro, Caraway, Cardamom, Ylang-Ylang, Oppoponax, Jasmine, Rose, Magnolia, Heliotrope, Patchouli, Vetiver, Oud, Myrrh, Sandalwood, Incense, Vanilla and Ambergris. The minute Griffie and I left the store we were blown away how great this fragrance smells in the cool night air. All I can say is Wow. This is beyond swoonworthy. This might be coma inducing swoon. *This fragrance is very hard to locate. If anyone knows where there are bottles aplenty...drop a line in the comments and I will pass the information to the gang and the blog readers. A, I have seen it at Bergdorfs (in store, not online) but wouldn't swear that they still have it. It is so good R. I feel like I need to alert Beth. I know she loves a good amber fragrance. I can see Beth getting sidetracked by Guerlain. I really should write to her. It has been forever since we gabbed. It's absolutely the best amber I've ever tried. It may be better than the Hermes (which smells divine on Annie!) and is better than Fragonard's Reve Indien to me, too. Now I must find the Blanc! Thanks to Griff for a good lead on that one! I am SO enticed by the description of this perfume, Annie, it's driving me nuts! I wanna smell it! I found it on several UK sites - have you ever ordered perfume from the UK before? Oh no!! I must try this! Yes, this is in the collection. Cute purse atomizer, too. Admit to the Guerlain distraction--but I can focus on shopping when I need to.